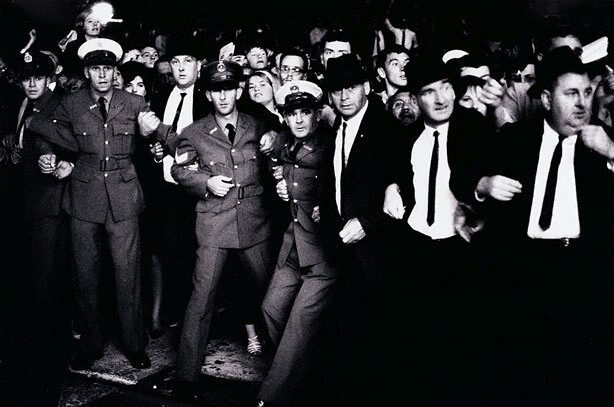 This image by David Moore of then US president Lyndon Baines Johnson (LBJ) depicts a crowd of excited men and women being held back by policemen. The first American president to visit Australia, Johnson’s three-day, five-city tour in 1966 was made to say thank you for Australia’s support in the Vietnam War (the tour included a state reception at the Art Gallery of New South Wales). Cause for much anticipation, Johnson’s brief visit also sparked a series of anti-war protests, notably in Sydney where activists lay before the motorcade on Oxford Street. Moore’s photograph shows just some of the almost two hundred thousand people who came to see LBJ in Brisbane, an important moment in Australia’s coming-of-age as a nation. Signed and dated l.r. verso, pencil “... 1966 / David Moore”.